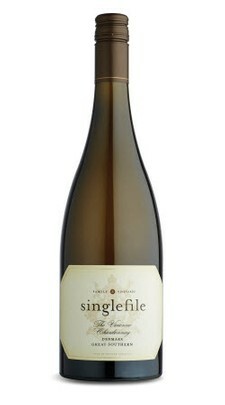 Flagship Chardonnay that has very limited availability (only 87 cases made). Fruit picked over three runs from the Singlefile estate vineyard, somewhat earlier than the 2014: 2nd February, 5th March and 18th March. Pressed into new and seasoned French oak, 8 months on lees. A rich evocative wine: Fleshy white nectarine, small white quartz stones, sweeter orange citrus, roasted macadamia nuts, hints of sweet butterscotch and fragrant oak derived light flaky pastry and fresh bread crust toastiness. Drive and length. The little kicks of spicy oak give a certain piquancy. Long flavour tail with precise grapefruit and stone fruit wonderfully set in place with that quartz rock mineral line. Top tier chardonnay.